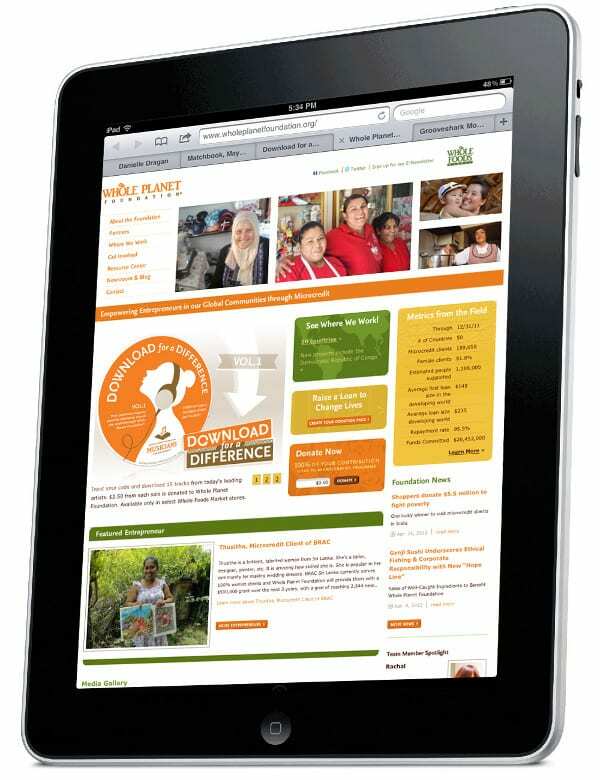 Whole Planet Foundation is a private, nonprofit organization established by Whole Foods Market. Its mission is poverty alleviation by providing grants to 30 microfinance institutions worldwide in Latin America, Africa and Asia. + Inspire came up with Download for a Difference – a campaign offering 17 songs in exchange for a $5 donation to WPF. Inspire created both a physical version of this campaign – customers at Whole Foods stores had the opportunity to purchase a download card for $5 – and an online version. + Inspire was able to include some of the best, new emerging artists in the campaign, including: Alabama Shakes, The Civil Wars, Bonnie Raitt, Ingrid Michaelson, Josie Dunne, OK Sweetheart, Katie Herzog, Andrew Bird, Grace Potter & the Nocturnals, Ivan and Alyosha, Foreign Fields, Matt Costa, Tim Hanauer, Josh Ritter, Phox, Tyrone Wells, Wye Oak, and Deer Tick. + Inspire created a custom Download for a Difference website that drew new traffic to the WPF website, and raised awareness of the foundation among a huge demographic of Whole Foods shoppers – music lovers. + 17 downloads would normally cost donors $17. By offering the gift of a substantial discount, WPF was able to emotionally fortify its brand and build a connection to Whole Foods customers. WPF and Inspire teamed up to create an innovative music campaign that raised funds and awareness among Whole Foods customers for the charity and its important work.